The moringa, native to India is cultivated in Mediterranean, tropical and subtropical areas . In USA, the tree can be grown in USDA Zones 9 through 11. In temperate climate, grow it in a large pot and place it in the sunniest part of your garden. The tree will go dormant below 18° C. As the tree is not frost tolerant, it will die in extreme cold weather. In such climatic conditions either grow your moringa tree in a large container or cover the tree with blankets or use Christmas lights if possible. It is, however, better to grow moringa as an annual plant from spring to autumn. I am growing moringa tree in Sydney from seeds. I have yet not tried growing moringa tree from cuttings. The moringa tree is a miracle tree, all of its parts including its leaves, seeds, roots, flowers, fruits and bark are packed with nutrition including vitamin A, B, C and K, calcium, potassium, manganese and iron, and protein . The leaves are the most nutritious part of the plant [4, 5]. Due to these moringa nutrition, moringa offers many health benefits in weight loss, blood pressure, skin, hair and brain health. The following moringa leaves nutrition chart shows that 100 g of moringa leaves have 4 times the vitamin A in carrots, 4 times the calcium and 2 times the protein in milk, 4 times the vitamin C in oranges and 3 times the potassium in banana . The moringa tree can be propagated easily from seeds and cuttings. It is a fast growing tree which produces drumsticks 8 months after sowing seeds. The moringa seeds can be germinated at any time of the year. Soak the seeds in water for 24 hours. Sow the seeds about a inch deep in 10 cm pot containing free-draining soil, a mix of potting mix and 50% river sand in equal amount. Place the pot in sun and keep the soil damp. The seeds will germinate in 5 to 15 days under ideal temperatures for germination 20-30°C (70-90°F). If the temperature is low, you can seal the pot in a polythene bag to maintain high humidity and keep the pot in a warm area inside the house. Transplant the moringa baby plant when it is 1 foot (30 cm) high. Be careful in transplanting, do not damage the tap root and disturb the root system. The moringa tree is not fussy about soil, they can grow rapidly in any soils, but prefers a neutral to slightly acidic (pH 6.3 to 7.0) soil. The soil or growing moringa tree should be free draining and nutrition rich sandy or loamy soil. Add river sand to the soil to make it free-draining and cow manure and compost to make it rich in nutrients. 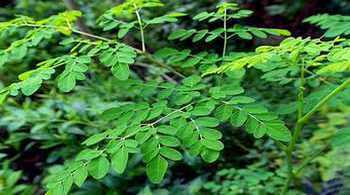 Plant moringa tree in a sunny place in your garden where it gets at least 5 hours of sunlight daily. It grows best in temperatures 25 to 35° C (77 to 95° F). Water daily to the young plant. Water less frequently, once the plant is established. Moringa is drought tolerant, but you should have an eye on the plant. You should immediately water the plant when its leaves start to sag. Fertilizing your moringa tree is not essential if you have added manure and compost in the soil. You can feed the plant by liquid fertilizer. The moringa tree can grow up to a height of 12 meters (40 feet) and width up to 5 meters (15 feet). The moringa growth rate is very fast. T he seed grown plant can grow 4 feet high in just 3 months! If not pruned, the tree can become unmanageable and difficult to harvest. It is advised to prune the tree when it is 4 feet tall to grow new branches. each branches should be cut back to 1 foot. each year you can prune the tree to a height of 4 -5 feet after the fruits have finished. Regular and frequent pruning will keep the moringa tree in bushier shape. The moringa tree is pest resistant so normally there will not be any pest problem. However, sometimes, caterpillars, aphids, fruit flies, etc. can cause minor damage. If the tree is infested, do not spray anything other than a dilute solution of neem oil, or just chop off the infected leaves and branch. Almost all parts of the moringa tree are edible. Start harvesting leaves when the plant reaches about a foot high. Immature seed pods, known as drumsticks in India contain dietary fiber, potassium, manganese and magnesium. The moringa seeds look like peas, contain vitamins C and B and can be eaten like peas. Can a moringa tree be grown in a container? The answer is yes, and it is advantageous if you live in extreme cold regions. The tree will die below 0° C (32° F) temperatures, so you can move your moringa growing in a pot indoors where the temperature is more than 10° C. You can move your potted moringa outdoors in spring or summer once all the dangers of frost are passed. The tree has a long tap root with very little other roots, so use a deep pot. The potted moringa tree needs regular water and fertilizer. When you see the root coming out of hole at the bottom, you should transplant the tree to a bigger pot. Do not disturb the root system during transplanting. 1. Moringa oleifera, Germplasm Resources Information Network (GRIN). Agricultural Research Service (ARS), United States Department of Agriculture (USDA).